‘Under the Surface’ focused on WA mining and minerals and the innovation involved in looking under the earth’s surface working with research scientists at CSIRO WA and Kalgoorlie Consolidated Gold Mines. Visualising innovation and discovery is a crucial part of this investigation in communicating the context of scientific research and its brilliance as it places Australia at the cutting edge of global science. ‘Under the Surface’ was commissioned by the Scitech Discovery Centre (WA) and as Artist in Residence, Gates-Stuart explored ways in which art can help communicate science to non-scientists and scientists alike, particularly in this instance of the science museum. The installation aimed at playful engagement allowing the audience to interact with the artwork by using their body gesture (hand movement) to control and explore the layers of context. 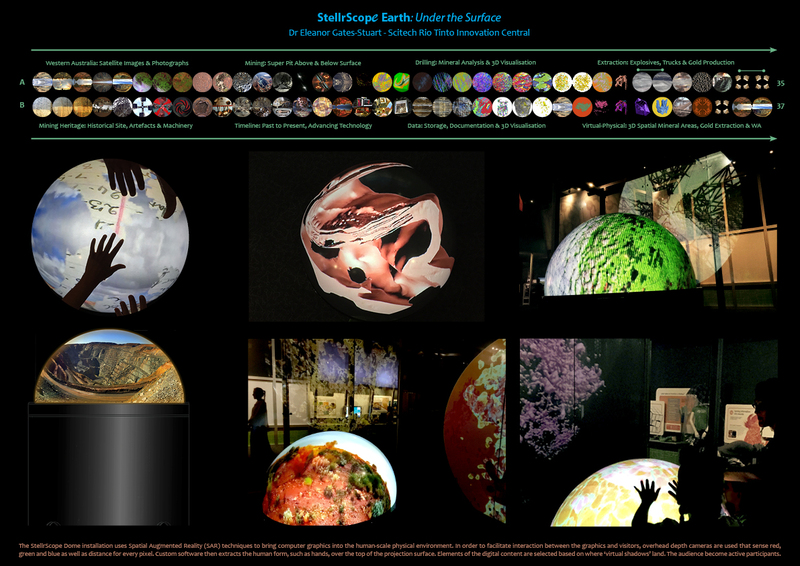 Influenced by scientific innovation, earth science and mining technology, with reference to historical artefacts, ‘Under the Surface’ was a collaboration of knowledge and information sharing, in bringing this artwork to completion. It explored complexity of technology in scientific and industrial innovation, repositories of information (both physical collection and electronic) through visual communication and interpretation through artworks.